Make this your healthiest year yet! JOIN US FOR OUR 30 DAY CHALLENGE! Practice 30 classes in 30 straight days with us and feel the benefits of yoga in your life. In addition to the substantial physical and mental benefits, those who complete a 30 Day Challenge will receive 25% off their next package or retail and 5 free class passes to give to friends who are new to the studio. If you miss a day within your 30 day challenge, you can double up on another day that week to achieve the goal of 30 yoga classes in 30 days! When is the 30 Day Challenge? You pick the 30 consecutive days that work best with your schedule and begin. We will have a chart posted at the studio where you can check each session off for your 30 classes, in 30 straight days!! We are offering a 30 Day Challenge Special of 30 days for $85. To sign up: Buy your package online or at the front desk, write your name on the chart and practice! “Surya namaskar”? “Moola band”? “Ujjyi”? “Namaste”? What is this stuff? Built around Surya Namaskar, a short sequence on which most vinyasa yoga classes are built, this workshop will provide you with the framework for any vinyasa or flow class. Intended for beginners to intermediate practitioners. Limited to 25 people. Sign up on line to ensure your spot. Explosive cardio and strength training with Essie Jackson from Peak Strength & Conditioning! Space is limited to 22. Sign up ahead of time to reserve your space. Regular class card to attend or drop-in. Want to learn headstand? Have an aversion to inversions? Since we rarely, turn ourselves upside down, this is natural. There are so many benefits from inversions. The gifts of Sirsasana are so great that even if you are not ready to do the actual pose, you can benefit by preparing for it. Regular class card or drop in rate to attend. Limited to 25. Sign up ahead of time. Come join us for an acroyoga journey. Learn new skills you never thought you could do in a supportive and exciting environment. Learn to spin, flip and fly, wile being lifted by – or lifting another yogi. You’ll be amazed by what you can do! Acroyoga requires no super human strength or flexibility, just a great attitude and willingness to learn. No experience needed but a background in yoga, movement, dance etc will be helpful! No partner required to attend. Early Bird Registration Rate ends Feb 25, after Feb 25th, $35 to attend. $15-20 suggested donation, No experience necessary! Contact Improv (CI) is a movement practice in which points of physical contact provide a starting point for explorations with a partner or partners. It was developed in America in the 1970s, and has been evolving in varied directions since then. In this introductory workshop, participants will learn some basic tools for practicing Contact Improvisation, including falling, rolling a point of contact, weight exchange, counter balance, and physical listening. To pre-register, or for more information, email us at Bburg.Dance.Net@gmail.com. Registration encouraged but not required. Experience the dance of the breath with Leia Jones and Martha Kastler. This workshop combines mindful movement and breath, breathwork and meditation. Leia’s playful yet mindful approach will incorporate organic dance movement, breath, and yoga postures to open the body gently. We will then transition to guided relaxation, breathwork, and meditation led by Martha. Martha’s intuitive guidance will offer participants the opportunity to explore the subtle realms of the breath. This gradually opens a greater awareness of the relationship between breath, energy, consciousness, and overall well being. Participants are encouraged to bring a pad such as a camping or Pilates mat that is thicker than a yoga mat for the breathwork portion of the workshop. A journal is also recommended to record your experience. Suggested donation of $15 - $25. Leia Jones is an artist, dancer and yoga teacher. She has a degree in Dance and Choreography from Hollins University, and is a certified Hatha Yoga instructor. Her personal practice is rooted in the unification of yoga and dance. Inspiring creative expression and empowerment through this combination, she has learned that mindful movement has the ability to quiet the mind while reconnecting us to our joyful-spirit. Her unique soulful approach is an exploration of movement, intention and breath. 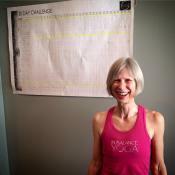 Martha Kastler studied Ashtanga Yoga with Jeff Tiebout. Having suffered numerous traumas and physical injuries, yoga was the first practice that showed Martha she has the potential for self healing. The deep focused practice of combined movement and breath awakened a profound desire to heal and be of service to others. As Martha became fascinated with breath, energy, and meditation she deepened her contemplative and esoteric practices and studies. This led to training in the healing arts of Restorative Breathwork with Kathleen Barratt and Bioenergy with world renowned healer Mietek Wirkus. Martha is a certified Barratt Breathwork® facilitator and is a masters level Bioenergy practitioner. Adam has been making and producing music since he was in high school. Holly will lead a 75 minutes vinyasa class open to all levels while Adam provides the soundtrack. Adam will bring in live instruments with percussion for a high energy class. Regular class card or drop in to attend. Join a community that cultivates joy, trust and balance through partner acrobatics and movement. No previous experience or partner required. Fly high, ground down and connect with your community! The busyness of life often gets us caught in a state of over-doing. This workshop will demonstrate the importance of slowing down. We will start with a body and breath focus, some gentle movement, and then transition into a restorative yoga practice. With yoga props supporting the body, you rest in postures for prolonged periods of time, and the body is able to relax on a deeper level. The stillness of the postures allow your body to rejuvenate, and your nervous system to calm, so you are naturally guided towards health and well being. Pranayama (breath-exercise) will be integrated throughout. Colleen will take some time after the workshop to talk with anyone who would like more information on her upcoming Restorative Yoga Training, at In Balance Yoga - September 25th to 28th. In a two hour hatha/flow session, Colleen will guide you through the Chakras (energy centers), starting with chakra one and moving up the spine to chakra seven. She will use asanas (postures), specific movements, intentions, and breaths to bring balance and awareness to the seven major energy centers in the body. In Lisa's class you will find emphasis on strength and breath to cultivate the spiritual warrior within as well as a hip hop vibe drawing from her old Brooklyn roots. $35 – One Night Only! Sign up in advance. LISA ROCKS! This three-and-a-half day course is for everyone and every body. It is highly beneficial for those who want to knowledgeably develop a restorative home practice, and for teachers who want to confidently and safely guide their students into restorative yoga postures. Open to all levels, variations and modifications included. The Dharma series includes asana, deep relaxation, pranayama and meditation. New Hot Class this Winter! No Friday, 7:45 pm Happy Hour Vinyasa. We will still have Gentle Yoga the 2nd and 4th Friday of the month at 7:45 pm. Free Dharma Vinyasa Classes each week. Check the webscheduler for our up-to-date schedule each day and to pre-register for class or use the app - Mindbody Connect. Link to webscheduler is at the top of the schedule page on www.inbalanceyogastudio.com. Each month we will highlight a different In Balance Yoga teacher so you can learn more about us and our IBY team. Tell us about your first yoga experience? I was terribly out of shape, overweight, and had a lot of stress from my work. I went in to my first class, which Eileen taught, knowing nothing about yoga. I thought we would sit in lotus and chant “Om” or something. By the end of 75 minutes I was exhausted, surrounded by a big puddle of sweat, and I felt great. I knew I had to come back and that this was something I needed to do for myself. It was only after developing a regular asana practice that I began to discover that there were other aspects of yoga than asana, but asana remains the core of my practice: moving meditation. What is it that you hope to share to your students? What can students expect when they walk in the door to your class? That we can, through our own direct experience of being embodied, find access to that which lives in us but isn’t us. Or, at least, it isn’t who we think we are. In the movement of asana, and in the movement of life generally, there is a stillness, silence, and spaciousness that is always available, that is our essence. When we find that space we start to understand what we really are. What happens in class depends on the class. On Saturdays Eileen and I try to bring in pranayama, bandhas, mudras and meditation as well as asana. In our other classes our focus is mostly on the asanas, movement with the breath. Saturday is more calm. Our other classes tend to be more rock and roll, and a lot of sweating. If you tire your body you can begin to still your mind, really relax and heal yourself. We want to learn more about you. What would your perfect day look like? Waking up beside Eileen just before the sun comes up makes for a pretty perfect day, whatever else may happen. Then meditation. Seeing my teacher, Tenzin Wangyal Rinpoche, a long yoga practice in the afternoon, cooking something vegan for dinner with Eileen, and more meditation in the evening. Come to think of it, most of my days are pretty close to perfect! “When you think you have a problem either there is something you can do about it, so no problem, or there is nothing you can do, so no problem!” It is a Tibetan proverb. How has practicing yoga transformed your own life? It has changed everything. I met Eileen in yoga. It brought me my health, my wife, peace of mind, flexibility, most of my friends. . . Jai Ganesh! What is your favorite music to listen to while practicing? I love music. There are so many different kinds and I like finding new things to play in class. You will find a lot of kirtan like Krishna Das and Bhagavan Das, rock, soul, funk, classical Indian downtempo, disco, and more when you come to my classes. What is your favorite aspect of teaching? Watching yoga transform people, especially when they aren’t expecting it. It doesn’t really matter why you come to practice, the yoga will change you. It will bring you closer to yourself and through yourself to the world. Watching that happen to yourself, and to students is just an incredible thing. What is it that you hope to share to your students? The practice of yoga asana is a transformative journey. My aim as a teacher is to communicate this at an experiential level so that my students commit to practicing regularly, even daily. There is a profound joy in being embodied creatures, but that joy does not just happen. We must actively cultivate it. Asana practice cultivates the art of being embodied with grace, ease, strength, and health. The deepest gift of regular asana practice is that it will support and hone literally everything you do in life. I also want to inspire my students to investigate yoga beyond the poses. Yoga has eight limbs and asana practice is only one of them. The Saturday morning Hatha Yoga class that Rob and I teach is intended to offer exposure to yogic practices beyond asana. The text Hatha Yoga Pradipika (especially the Bihar School version) is a great resource. I recommend experimenting with different practices and working diligently with those that are best suited for you. Create a sacred space in your home and return to it every day for practice. What inspires your teaching style? I feel strongly that asana practice should not be sectarian. I encourage students to practice all styles. I personally like to create a new sequence every time I teach, but I also like the styles that repeat the identical sequence each time. I like experiencing the yoga of different schools and diverse teachers, learning from all, and incorporating what I learn into my teaching. What threads through every class I teach is the emphasis on breath-work during asana practice. Asana practice should always build pranayama (deliberate deep breathing) into the flow of the poses. I also emphasize the importance of setting a higher intention for practice. Dedicating our practice to something higher is crucial, so that the ego does not hijack our yoga. The ego will make you approach poses like personal trophies to acquire and display. Or conversely, the ego will make you abandon yoga because you are not “good enough” by comparison to others. By making our practice a dedication to something higher (such as a higher purpose, for example) we can rein in the petty concerns of the ego. Choose a dedication that makes your heart sing and reaffirm it each time you practice. A perfect day includes environmental writing, yogic practices, a wonderful vegan dinner, rubbing the dog’s belly, and Rob’s beautiful company. Not necessarily in that order. I always like to say that yoga is the most important thing in life. Not because it is literally the most important thing, but because it is foundational for everything else. For me yoga is the practice that has freed the prana (life-force) that exists within me. That prana is infinitely more intelligent than “me.” It has never stopped teaching me how to work, how to move, how to dream, how to eat, how to be. One of my teachers says that the spiritual path begins with one unshakeable niyama (vow). By practicing yoga daily, rain or shine, I have come to understand that all of life can be founded on one unshakeable niyama. Choose your niyama carefully, but once you have chosen, never doubt or swerve from it even for an instant. PARKING: Beginning March 1st, we will validate parking at Kent Square for two hours when you practice at the studio. JUICES FROM ART FORD: In Balance yogi, Art Ford has fresh juice for donation only. Limited quality available. Suggested donation $4, cash or check only. Please return your glass jar for him to recycle and use again. Early Valentine's Day Juice: Pineapples, Apple, Pomegranite and Lime!